In the last two post of this series, we’ve really laid the groundwork. We’ve creating a compelling challenge and we’ve created an easy path for your audience to follow, to ensure anyone who lands on your website is taken to your sign up page. Now comes the part that the majority of bloggers and small businesses struggle with. The traffic. This is often the aspect that most people jump straight to, however, the points we have covered in the previous two posts are just as important. It doesn’t matter how much traffic you drive to your website if once they are there, they do not sign up to your challenge. So, make sure you have the foundational pieces of your customer journey in place, before your start driving the traffic to your site. You don’t want to waste all the traffic that’s going to be coming in, after all. 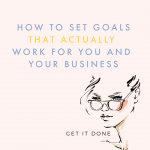 But enough of that – you came here for ideas on how to get your challenge out there. Let’s talk promotion. Promotion, getting traffic to your site, getting your name out there. 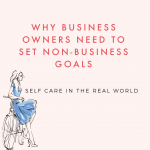 All things that small business owners struggle with. In fact, getting traffic to their sites was the No.1 thing (along with growing an email list) which Creative and Coffee subscribers indicated they needed help with in last year’s survey. Before we start, I would just like to say that it is important to remember your goal, especially when talking about traffic. Remember to think about the step by step journey we want to lead our customer or client on. From when they first see us – right through to joining in our challenge. As we talked about before, we don’t want to just piecemeal promote across as many different channels as possible. We want to offer a well rounded experience to our visitor, where they can enjoy content that comes together to support and complement each other. You might find it useful to create one central piece of content and have each promotional method linking back to it as a central hub. For example, you might have your blog post as your central piece of content that you want to drive traffic to. Then have a Pinterest Pin linking back to it. A Facebook Live session expanding on a particular point in that post. All this content works together, to present a well rounded experience that promotes the whole and drives traffic to a central (high converting) place. With that in mind – let’s jump in. Let’s start with an easy one. Most social media profiles give you a link within your bio to share your website – but let’s be a little bit more intentional. 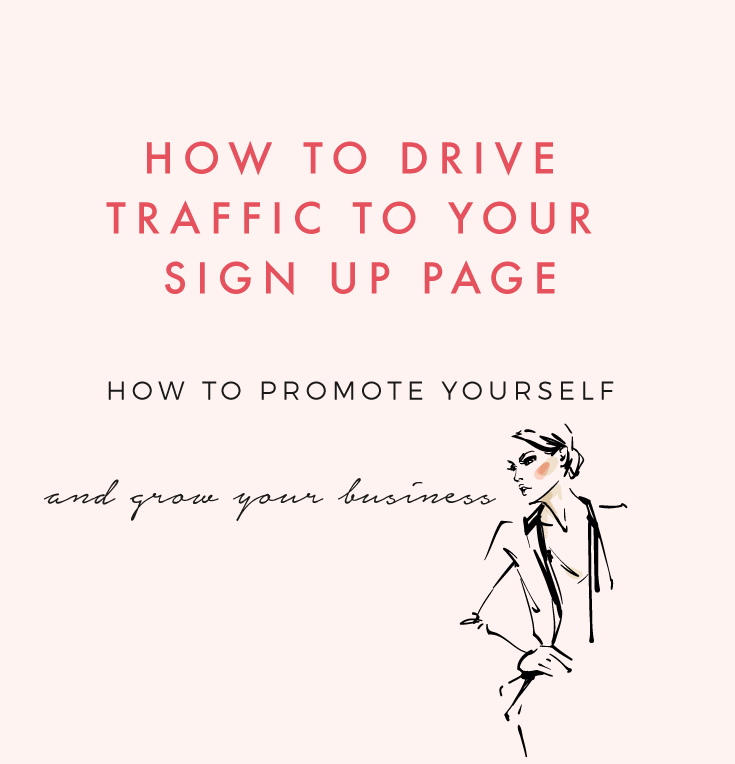 Send your traffic from social media to a dedicated page promoting your challenge instead and give them the choice to sign up. Before we start looking at bringing traffic in, we want to make sure that the traffic we are bringing to the site is not only signing up for our challenge but working for us to. We want to make sure that our content is as ‘shareable’ as possible. This is so we get some help with getting our content out there and in front of new audiences. As I mentioned in our previous post in the series, you want to make sure that your email subscribers, both current and those joining the challenge, can very easily share the challenge out to their own audiences. Create some pre-made social graphics and insert a call to action in your emails to ask your audience to share. When someone signs up to a challenge you might want to direct them to a ‘Thank You’ page. Firstly you can let them know to open your email confirmation you’ve just sent them. Secondly you can plant a big button on the ‘Thank You Page’ asking them to Tweet or otherwise share your Challenge Landing Page. 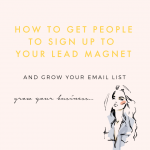 The easiest way to create this is with a program like Leadpages but you can also do a DIY version if you like using MailChimp to send your subscriber back to a ‘welcome page’ you have created, just like any other page, on your site. We’ll talk more about how you can use Pinterest itself as a dedicated source of traffic below. You also might want to insert a ‘Click To Tweet’ by highlighting a section of text or quote that your reader might like to tweet out to their audience. We use Social Warfare to create our ‘Click To Tweets’ that you see in our posts, like the one below. However you can also create Click To Tweets by inserting the text you want to quote into their website, which will generate a small line of code for you to insert into your post or page. I should of course say that as I love Social Warfare so much that I am a proud affiliate because I do think it’s just such a useful plugin. So any links throughout this post are my little affiliate links for Social Warfare because I think they are super fab. Thumbs up from me. If you have created, say, three blog posts to go with your challenge, you might want to link to ‘related posts’ at the end of the post itself. Hopefully your potential client will sign up within the call to action of the first post. However, this might be the first ever post someone has read of yours. Or they might want to learn more about the subject the challenge will be on before they commit a week of their lives to you. So whilst your call to action should be in bold at the beginning, middle and end of your post – if this does not catch their attention you will want to make sure that they move to another piece of content on the site. This is much preferable to them clicking away – maybe forever. I think it goes without saying for most bloggers and business owners but do make sure you have some way for your visitors to share your blog posts generally. This usually comes in the form of share buttons which sit on the page as you scroll down, or perhaps stay static at the beginning or end of posts. Two popular plugins to achieve this are SumoMe and Social Warfare. Which is better is really down to personal preference but this blog uses Social Warfare to create the blue shareable buttons you see floating at the bottom of your screen. This is really helpful to get your content out in front of new audience that your own promotions might not have reached, creating a new source of traffic for your content. Following on from the above point, now that you have convinced said audience member to share your post, you will need to make sure that it looks good when shared. By that I mean, when someone shares your blog post, the correct descriptions and picture is displayed. 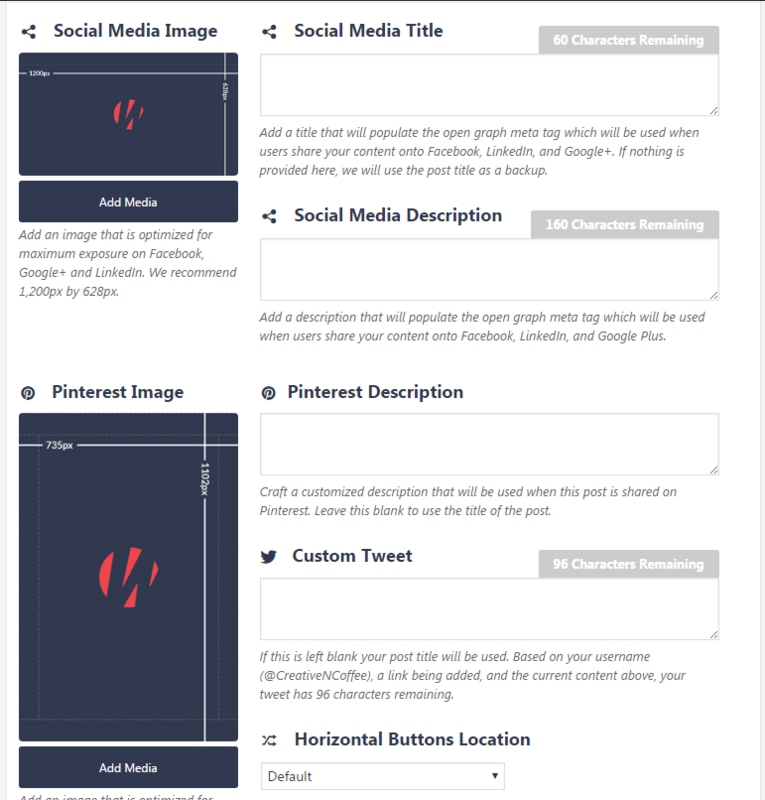 Again I use the plugin Social Warfare for this, as you can see from the screen shot below I can choose what picture is shared for Pinterest and Facebook/Twitter as well as what the description should be for each. I should say that Social Warfare is a paid plug-in, although there is a free version which has some limited features of the full packages. I rarely recommend paid products, as I know many of us are starting out and on a budget – but honestly it saves me a huge amount of time and hassle, so to me it’s worth it. However, you can also use the Open Graph within Yoast SEO to make sure the platforms pick out the appropriate pictures for Facebook. You can read more about how to do that here. There are more social media sites out here then I care to mention, so I will just cover the main ones here. Of course there are niche specific sites that might be more relevant to you, such as Goodreads, Ravelry or LinkedIn. So don’t be tempted to only post on the sites recommended by others, but rather, on the sites where you know your audience is most likely to be found. It’s likely that you already have an established schedule for posting to social media. If your followers have become accustomed to you posting at a certain time or day then you might want to simply adapt your current schedule to your needs and augment it with extra content. If you don’t have a particular schedule then you can create your content strategy from scratch and build from there. So, of course, you will want to make sure you share the actual challenge sign up page to your Facebook page. You can also schedule all the content that you have created, whether that might be blog posts, vlogs or podcasts to be posted when they are published. Like Twitter you can pin a specific post to the top of your newsfeed, so you might want to pin your challenge announcement to the top of the page. As we talked about in the Masterclass on Creating a Five Day Challenge we hosted in The Coffee Club this month, being able to create different touch points with your audience is really important. With such a range of mediums that we have access to now and, with the dominance of video in recent years, it’s good to branch out a little. The advantages of video are many but one of the biggest is that it really helps to create that engagement and relationship with your audience. No matter how gripping a writer you are, being able to see and hear someone through video, instantly helps create a closer relationship and builds mores trust. So don’t limit your channels of communication to one medium. You can use Facebook Live to talk a little more about your challenge, or perhaps create a little series leading up to the launch of your challenge, with a small tip each day. You could also talk about the blog posts you’ve just published, giving some more detail or elaborating on a certain point. If you have a bigger group of people, you could of course take dedicated Q&As as well. It is hard to deny the popularity of the Facebook Group. An important part of creating an engaged challenge is creating an engaged community. I’ve tried platforms like Slack, or more casually creating hashtags for people to find each other with on, say, Twitter but undeniably Facebook has the edge here. The reason for this is that Facebook is a platform people are already on and familiar with. You are likely to get more visits as people are already on the platform – instead of having to make a dedicated and purposeful visit to your Slack group. As above you can post your Facebook Live sessions within your group, as well as helping to prompt discussion surrounding your challenge topic. You might want create a series of prompts leading up to the challenge. This is an excellent way of creating habit of checking into your group before the challenge starts, as well as helping to make sure people are prepared to start the challenge. For example, making sure they have the right equipment, some pre-requisite knowledge or simply some motivational coaching to get your participants into a focused mindset. Don’t forget to ask them to share the challenge and get their friends to join in too! If you are not ready to start running Facebook ads right now, that’s totally cool. I think you can run a very successful challenge/promotion without ever needing to spend a dime so I don’t want to get into too much detail here. However, it is something to consider if you really want to up your game and are ready to take that next step. In my opinion, it’s all about ‘re-targeting’ ads. This is where ads are shown to people who have visited a particular page on your website but have not signed up. So, for example people who visited your blog post and didn’t sign up or people who visited your landing page and didn’t sign up. This is much more effective than advertising to a ‘cold’ audience ie people who might not have heard about you before. Re-targeting ads, instead, are focused on people who have already expressed an interest in you and your challenge and thus are much more likely to convert. You can read more about re-targeting ads on the Facebook site here. Pinterest is an amazing way to drive traffic to your blog posts. Now, when I say this, I know there are a few people out there that say ‘I hear people say this all the time but it just can’t get it to work for me’. I know the feeling. When I first started on Pinterest I couldn’t get it to work for me either. Now, there is plenty of advice out there about how to create a successful business profile for Pinterest. Much of the advice revolves around creating a compelling bio, branded (and attractive) looking pins and using SEO. I’ll talk about SEO in a moment, but for me, the absolute crucial piece of advice was: consistency (and to that I might add the word persistence). 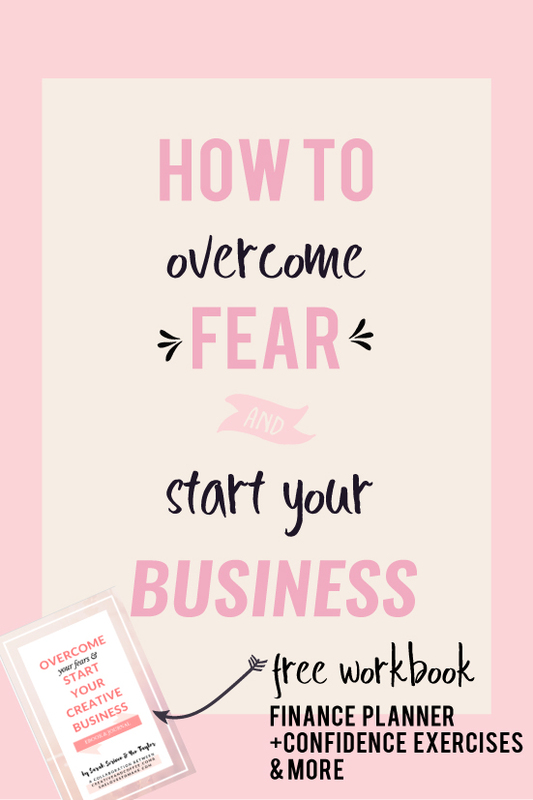 To give you an example, How To Overcome Fear and Start Your Small Business was one of the first blog posts I ever wrote for Creative and Coffee. This was the original pin I created for it. It did not get many re-pins. 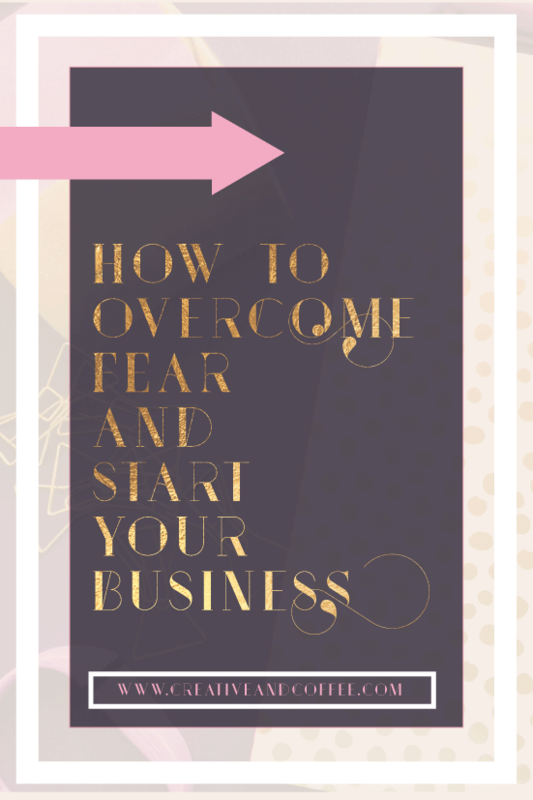 About five/six months later I created an eBook to go with the post with my lovely artist friend Yen. In honor of the occasion I created this Pin. This Pin did better, a few hundred pins, which was about quite good for me at the time. At this point I could have really given up Pinterest, it was doing OK for the blog but it wasn’t bringing in a flood of traffic. 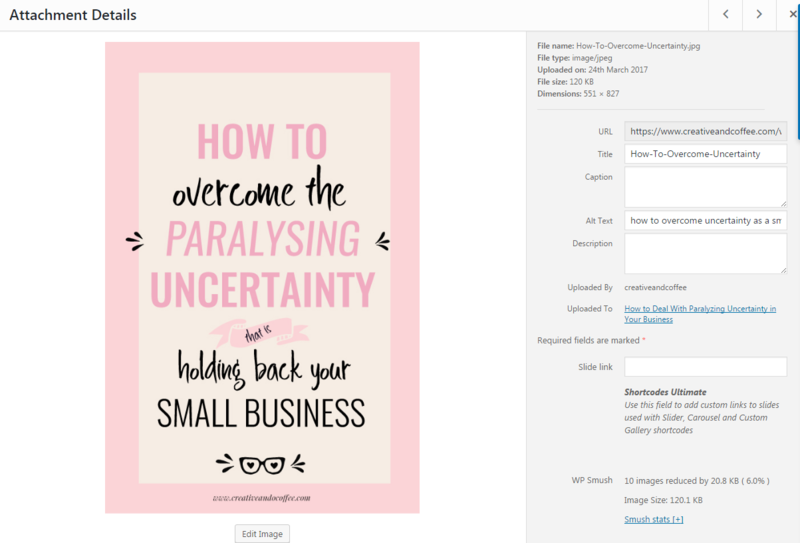 But I kept plugging away and plugging away – until, over the space of a week or two, that Pin shot up to nearly 3000 repins. It’s now at nearly ten thousand. 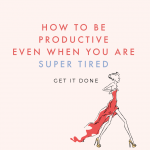 My advice, if Pinterest isn’t working for you? Keep tinkering with the design of you pin until you find one that does better than the rest, even if it’s only getting 20 re-pins where you others are getting five. And then re-pin the hell out of it. Obviously don’t spam your poor followers to death – keep a healthy mix of posts going but don’t give up! To develop that point a little further, if you are starting out or have a small following on Pinterest it can be hard to ‘break through’. So make sure to sign up to some group boards, to help you gain some more exposure. To find group boards, simply type some of your keywords that we were talking about before to find boards that are sharing content in your niche. In the results look for the boards like the little group symbol. Most boards will have instructions on how to join and who to email. 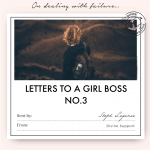 For example this wonderful group here: Creative and Coffee ‘Girl Boss Business Tips‘ come join us! I have included Pinterest under the social media title, however it is more accurate to say that Pinterest is really a big search engine. And what do search engines love? Keywords! Just like Google, Pinterest is searching for those keywords so it can offer up the most relevant pins. So make sure to include those keywords we’ve been researching in your Pin description. You can do this simply by popping your description into a plugin like Social Warfare or by making sure your pin image has the write up in the Alt Text box, when you upload the picture into your blog posts. You can see the Alt Text section under the caption box. A useful thing to note is, much like Google, Pinterest will give you ‘suggested’ searches as well. If you look to the top of the screen you will see different categories and topics that Pinterest thinks you might be interested in. This is another great way to get an idea about what people might be searching for on Pinterest. 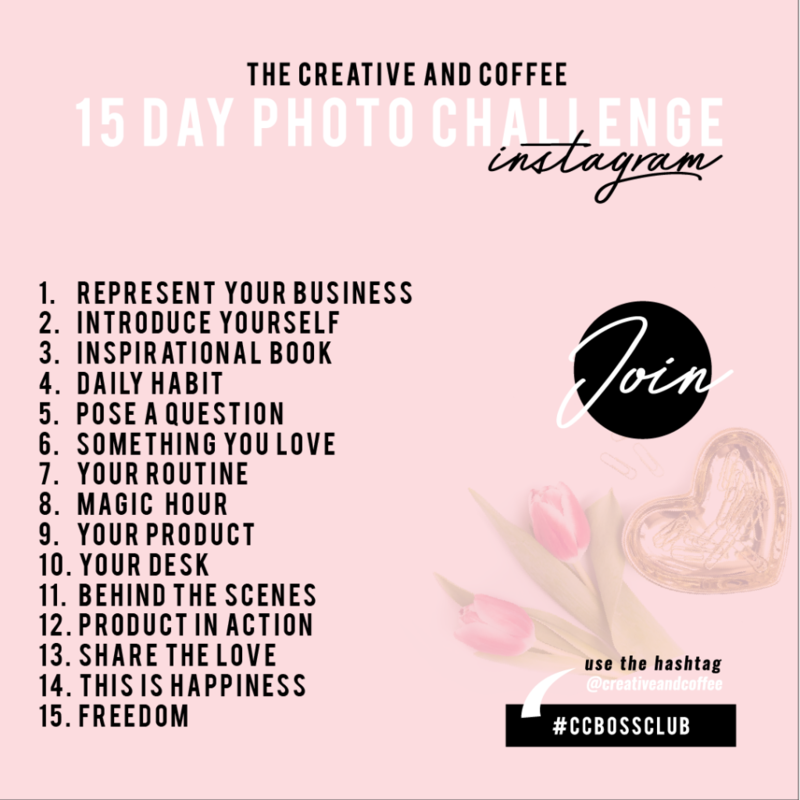 As you know Instagram is my favorite platform, I love hanging out there and chatting to you all – but can you use it to effectively promote your challenge? Ps not friends on Instagram yet? Come join us! It’s where the community does its best bonding! Instagram as it’s own video platform now, Instagram Live. Much the same as it’s Facebook counterpart. Personally, I think if you are deciding between the two, I would stick to doing Facebook Live as you can save it within your feed for people to go back and re-watch. Thus creating more content that you can direct your audience too, both in the Group and via email. A little less stressful than going live, these pre-recorded snippets can be a really great way to connect with your audience in the moment (as they are only available for 24 hours). I think these can be a nice little addition to your challenge promotion but I think they are only useful if you use Instagram stories in a fairly consistent way. Hopping on and doing one or two before your challenge launches probably isn’t going to make too much of an impact. However, popping on every day, maybe as a little miniseries, or a everyday behind the scenes might, might add that extra momentum. 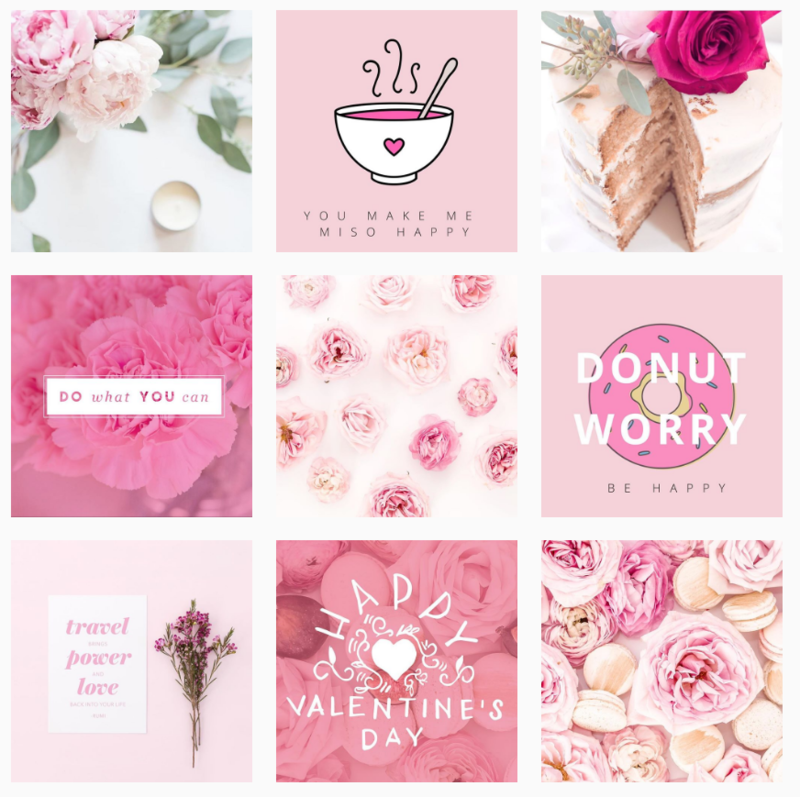 If you have time and Instagram is a platform that has high audience engagement for you, then you might take the time to create some dedicated graphics for Instagram to share. Both to encourage your participants to share to their own Instagram feeds, as well as making sure you own followers know something is going on. It may sound silly but when I was creating my Instagram challenge, I thought one or two graphics would be enough to announce it and let people know it would be starting soon. However, on the day the challenge started I still had people popping in and being surprised their was a challenge going on. So don’t be afraid to create a little series of posts to promote your challenge, even if it is not an Instagram one. Make sure they are branded appropriately so people can see that they are part of the same series and to encourage curiosity as to what this might all be about. To be the most effective you can be on Instagram, you really need to be able to wield your hashtags with purpose. Look at what other people in your niche are having success with and use these to start searching for similar tags that you might not know about. The idea is to position yourself in front of your ideal audience. A good mix of popular and more niche hashtags should be observed. This ensures that you can get in front of more people, using the popular tags but also attract your ideal participants, by using the more specific niche tags. Although smaller tags will give you, potentially, less exposure, with less competition you are more likely to be seen. Also, you are more likely to be make it into the popular ‘top posts’ for the category, that sit at the top of the hashtag page – which get much more view and exposure as they remain their for longer. If this is something you are not too sure about, you might find our article on using hashtags for Instagram helpful. 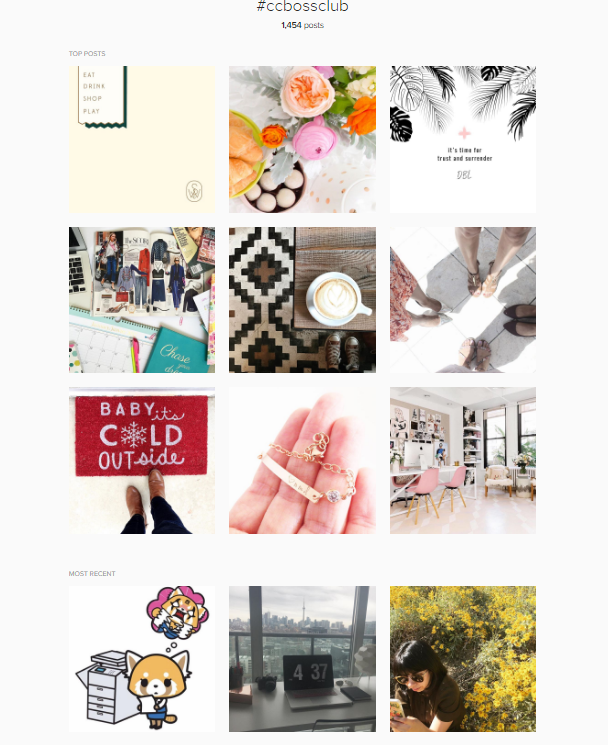 If you want to bypass the research and the guessing, our Essential Guide To Instagram For Creatives has a list of popular hashtags across the range of business of creative categories that I’ve researched for you. You can check the book out here. Whilst finding the optimum time to post is important across all social media, I mention it in particular under the Twitter section because with Twitter, you are often not looking at a single time to post but rather multiple times. Whilst platforms like Facebook and Instagram will not thank you for multiple posts a day, Twitter is most certainly a platform where those rules do not apply. In fact Co-Schedule recommends posting to Twitter 12 days a day. Whilst I recommend having some kind of scheduling app for all social media (it’s a huge time saver) Twitter is most certainly one that would bury you very quickly without one. I use Audiense (formerly SocialBro) in order to get a complete look at when the best time to post on Twitter is and then I use Hootsuite to schedule my Tweets. Twitter, as you know, really limits your words but it’s also the perfect platform for throwing in bite-size facts and quotes. So whilst you might be promoting your actual content, like blog posts, on other social media like Facebook – you might turn to Twitter to post facts and quotes from that content or your challenge. If you have any kind of feedback from your audience already about the challenge – perhaps how excited they are to start. This would be a great place to re-Tweet this little pieces of social proof too. So whether you want to go to the effort of this, or whether it would be worth the return will really depend on what your end goal is for your challenge. For example, if it’s simply a lit building exercise then it might not be worth the extra time. However, if you challenge is part of your launch strategy for a product or service, then including a content might be a great idea. Obviously this doesn’t have to be restricted to Twitter, but I ‘ve seen this done particular well on Twitter because it requires very little time commitment from your audience but can gain you a lot of exposure. So, for example, you might ask your audience to share (using your hashtag) a quote, or a link to your challenge or to encourage them to take a snap shot of workbooks they may have printed out a head of time. You will then randomly pick a entry from the list of tweets to gain a special prize. The prize can be anything at all, big or small. For example, free access to a course, eBook or some other resource you’ve created. The only word of caution I would advise here is to make sure the prize is relevant to the audience you want to attract. For example, if I were to offer a stash of Rifle Paper Co goodies as a prize, I would get a lot of people re-tweeting and joining in who had no interest in my business – but loved themselves pretty stationary. As it happens there is quite a large cross over in my audience and Rifle Paper’s but do try and make it as specific as possible. As well as Facebook, you can pin a Tweet to the top of your feed where it will stay permanently (or until you unpin) thus vastly extended the life of it’s visibility. May I suggest this would be the perfect place to pin your link to that landing page we were talking about? Ps don’t forget to change the link in your Twitter bio too! In my opinion this is a very useful way of not only getting in front of a new audience but creating some valuable back links to your website (hooray for SEO points). This is not confined to just guest posting on other people’s blogs, this goes for podcast interviews, vlog interviews and, in a loose definition, activities like joint webinars. The important thing here is to make sure you have a clear path and goal set up. For example, if you guest post and just leave a link back to your website, then it might not be that effective. 2. You send your new audience back to a page, specific to that offering. 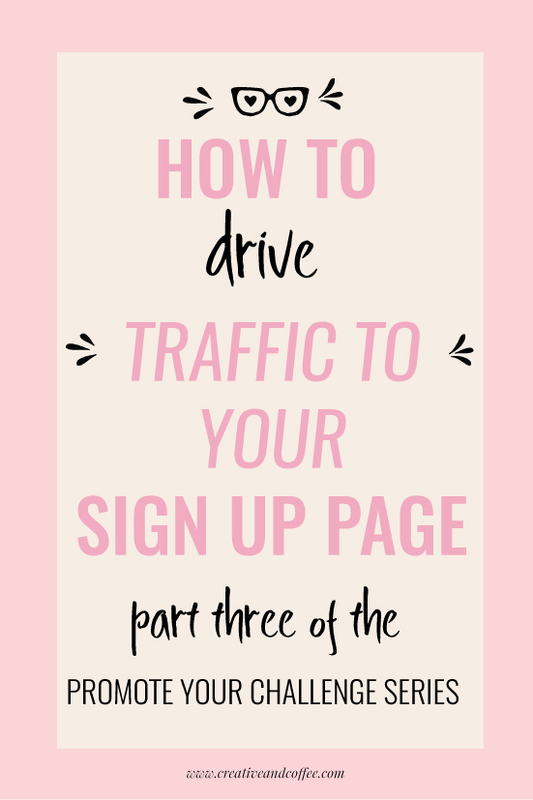 If you have a specific place to send visitors, for example your landing page, you can use your guest post to send traffic through to your challenge sign up. Hopefully you can create your post/interview to be on a topic that it is complementary to your challenge. However, don’t make your post too hell bent on funneling people back to your site at every opportunity. Make sure you provide plenty of value and be respectful of the kind host of the website on which you are appearing. Make a list of blogs that share content similar to your own and has an audience that might be interest in your challenge. Someone who sells a complementary product or service to your own is ideal. Something we tend to skip over is actually reaching out to people and asking them to share their content. Mainly because the idea of reaching out to someone in this way makes us want to curl up and die. We sometimes forget, with all the social contact of sharing and emailing, how many people we have started to form relationships with. So whilst the thought of reaching out to a stranger can make us squirm, you might find that you actually have more people that you can reach out to and ask for a kind favor than you thought. Perhaps past guest posters of your own. 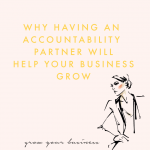 Business friends and supportive groups that you are involved with might be kind enough to pass on your blog posts to their audience. 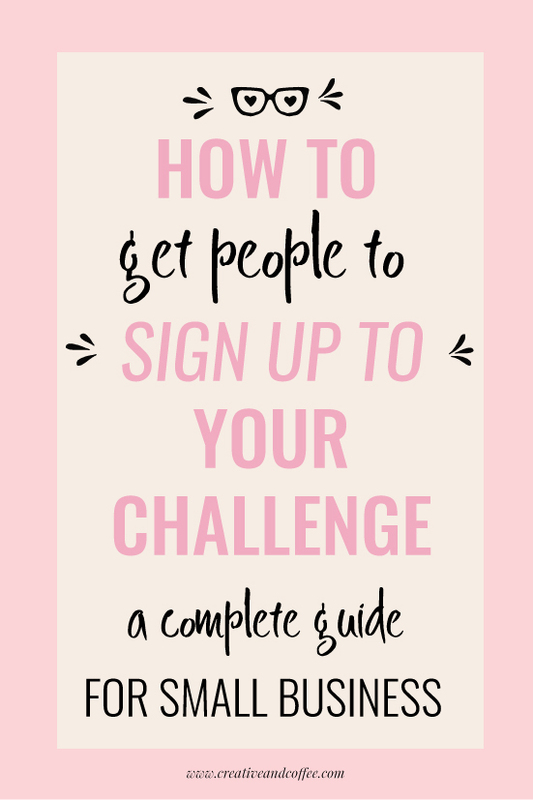 I would say when asking people to share, if it is someone that you don’t have a very close relationship with, it might be better to ask them to share a blog post or useful resources, rather than your actual challenge sign up page. Of course this is very much dependent on context and your own judgement, sometimes it just isn’t appropriate but sometimes you have some friends happy to help you out. How many people do you email in a day? If you are anything like me it is quite a few! Why not just pop a brief sentence about your challenge and pop the link to your landing page in the signature of your email. Something I find to be quite an underrated resource for promoting content ( in addition to getting to know your audience better) are communities and forums. Some popular ones are; Reddit, Quora and Triberr. Forums are the places where your ideal audience members are hanging out and looking for solution to their problems. This is more of a long term strategy as most forums do not take kindly to people popping up and sharing only their own post and disappearing again. Much like any Facebook Groups you are involved with, keep an eye out for any one struggling with a topic you can help with and be generous with your time and knowledge. If you can suggest a resource of your own to help them then that’s great. The best rule is to always come from a place of giving and not from a place of self-promotion. And there you have it, our complete beginner’s guide to launching and promoting your challenge. I hope this has given you lots of ideas about ways you might like to structure, promote and share your challenge with your audience. I hope you enjoyed this post and found it useful. I would be a hypocrite if I were to not take my own advice here and kindly ask you to share this post if you think it’s something your own audience could benefit from.